"This post was first published on BillMoyers.com"
The horserace polls dominating today’s political news are worse than misleading – they’re bad for democracy. They’re as corrosive of America’s self-image as the news industry’s obsession with murder and disaster, a black hole wildly unwarranted by actual crime and catastrophe. They’re as toxic to our spirit as the advertising industry’s brilliant cultivation of loneliness and desire, a yearning it persuades us to slake by spending money. Worse, once the nominees are chosen, the point of poll coverage will be that, unless you live in a handful of zip codes, your vote for president is irrelevant. How’s that for civic uplift? Nine out of 10 are white. Six out of 10 are men. Most are over 50. Most did not attend or graduate from college. Most are Protestant, and half attend religious services weekly or more. A third to half of them think humans have existed in their present form since the beginning of time. Nine out of 10 think it’s more important to protect than to control gun ownership, and half of their households include gun owners. Three out of four would vote against any official who voted to raise taxes. Nine out of 10 think that government is already doing too much to solve problems; that government aid to the poor does more harm than good; that blacks who can’t get ahead are responsible for their own condition; that it’s not government’s responsibility to make sure everyone has healthcare coverage. Nine out of 10 never use public transit. Three out of four think the country has gone too far to protect the environment, and they believe there’s no solid evidence that the Earth is getting warmer. Two-thirds think expanding oil and gas production should be the focus of energy policy. A majority agrees with the Tea Party. Most of their close friends share their views on government and politics. Three out of four think of themselves as a typical Americans. I drew the characteristics above from Pew data on the two groups most likely to vote in Republican primaries – socially conservative populists, and pro-Wall Street, pro-immigrant conservatives. If there’s little overlap between those tribes and yours, you may be disconcerted, or infuriated, that their presidential preferences drive the national news. Their voices are as lopsidedly powerful in the media as a talk radio bigot, a gangsta rapper, a sadistic cop, a car chase that consumes hours of meaningless local TV news, a missing plane that consumes months of cable news airtime, a Kentucky county clerk who won’t sign a gay marriage license, a Kardashian, a Koch, a shark attack. On top of this, in November, Electoral College arithmetic means that the highest-value voters will be swing voters in swing states. Most states are reliably red or blue. The ones that aren’t, the key swing states, number – depending on whose analysis you like –11, seven, five or just three. Many of those states will tip one way or another by a very small margin, which means that the presidential election could be decided by a crowd that wouldn’t fill the Rose Bowl. 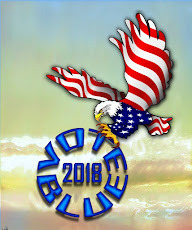 Though there will be some effort to pump up the turnout of the base, most advertising buying, ground game spending and candidate scheduling will be driven by the pursuit of those undecided voters. Next fall, if you want to know what winning the White House is about, ignore the liberal or conservative tribes. The data most worth knowing will describe people who will have spent the past two years ignoring pretty much everything that Democrats and Republicans say they stand for and will do. These Americans will be unlike you, but the difference will not be ideological. It will be the difference between being passionate about a leader who shares your beliefs, and being uninformed, disengaged, alienated, indifferent. Just like you, they’ll have only one vote to cast. But theirs will actually make a difference. Must watch MSNBC segment below! MSNBC's Lawrence O'Donnell, The Last Word, broadcast a segment last night that for some reason the networks webpage developed decided not to post it to the website. Rather than post the most worthy piece from last night's show, someone at MSNBC'S website team decided to run a silly no and ignorant segment about a fisherman harassing a Mola Mola (Sun Fish) warranted a web spot. The downfall of MSNBC is seriously ugly and growing more inane and correspondingly uglier. The segment of which I speak is capture below as part of the full 43 minute episode. The salient segment starts at the 14:30 mark and ends at the 19:10 mark. what you will find between those segment marks is a well developed presentation about Carly Fiorina's involvement in what has been reported as a $4 billion dollar hit to US tax payers. On a day when the CEO of Volkswagen resigned after revelations of an wide spread international scheme to hide actual exhausts readouts from its diesel engine cars, we are reminded of the fallacy of the CEO as a steward of "Corporations are people, my friend." These people are greedy corporate rock-stars who in many cases posses far less business acumen than the guy or girl serving you that Egg McMuffin. 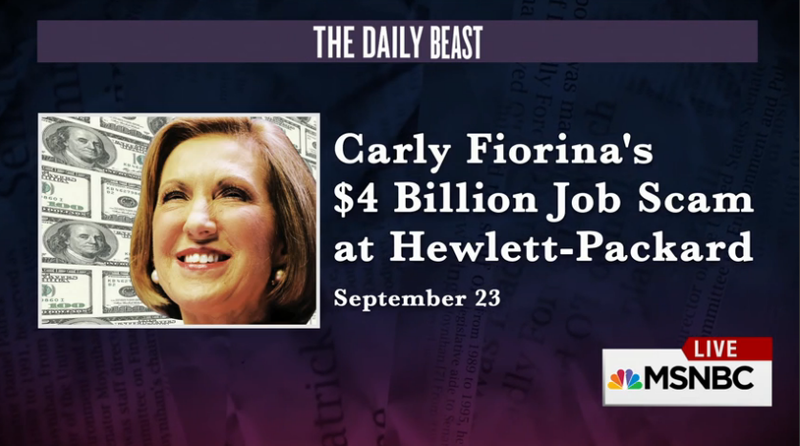 Fiorina is a political mirage. She offers no record of accomplishment. The record she offers includes typical "vulture capitalist" tendencies. As is always the case with the"vulture capitalist" the middle class becomes the platform for personal riches while offering millions as sacrifice towards supporting corporate strategy. Her record is available review; it amazes some actually feel she is worthy of the GOP nomination. Five years ago a weakened congressional candidate, Barbara Boxer, we poised to possible lose her congressional seat to Fiorina (behind millions personal dollars spent by Fiorina) until this ad ran just before the 2010 elections. Despite the possibility of a serious "ax-to-grind", I am going to offer a link to a piece in which her former husband offers additional perspective.